If I install the Google Play Store, will the Alexa feature still work on my Fire HD 10? It should not affect the apps and services already on the tablet, but give you more access to Google apps and services. Download the following files and transfer them to you Kindle Fire. Then using a file explorer app on your Kindle (I recommend ES File Explorer ) install them in this order. Google Service Framework, Google Login Service, and Google Play Services. Download the files Vending.apk and Google Play Store 4.1.10 and transfer it to your Kindle Fire HD. Copy the Vending.apk to your the system/app folder. 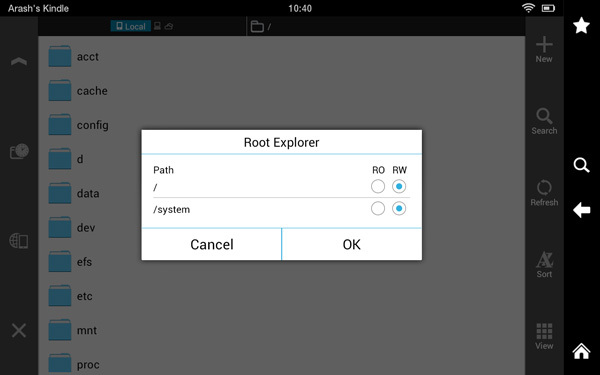 If you are using ES File Explorer (video tutorial) be sure to go into ‘Tools’ option under ‘Root Explorer’ then ‘Mount R/W’ and set both setting to RW (see picture below). Once the file is copied to the system/app folder then tap to install. That’s it, now you have the Play Store on your Kindle Fire and you should see it under the app section. Open the app and add your Google account info. After this we are going to upgrade to the latest Play Store. Now using the File Explorer navigate to where you originally transferred the Google Play Store and install it ( do not move to system/app folder ). It will ask to replace an existing application and you will choose okay to proceed. This will now install the latest Play Store and you are done. At this a reboot is recommended. Once you open the new Play Store I would recommend to go into setting and disable auto updates . Make sure to only update apps in the Play Store that you downloaded from the Play Store since there are crossovers from Amazon. The basic rule is to update the app from the store that you downloaded the app originally. Now you can enjoy all those apps, movies, books, and music from the Play Store. You Kindle Fire HD just got even better. Enjoy and be sure to let us know if you have any issues or questions.